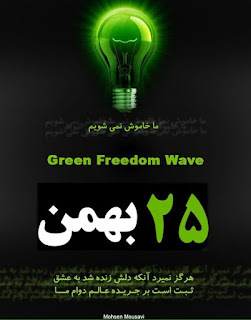 Internet Anthropologist Think Tank: Exclusive: Iranian resistance speaks, NO Green movement. Exclusive: Iranian resistance speaks, NO Green movement. THERE IS NO GREEN movement! Sorry! Moussavi and Karoobi only fired the last shot to the head of the youth who had banked their hopes on a shield called the green movement when they announced any protests illegal and against the wish of the state and when moussavi announced in various ways that e is not with the "deviated" current that is against the establishment and wants complete change. I am afraid most youth who had hopes have been frozen ans are still. The only current that was alive and is still trying to keep going is the PMOI ( they call them the mek). That is the reason why the regime has invested all its might to get rid of them and their supporters every where.. I recall that only MEK supporters caught in the 2009 uprisings were killed, or hanged or charged with Moharebeh... some sympathisers gave way under torture and pressure and distance themselves but most are still in prison and under enormous torture. So any form of change will only be effected if the US stops helping the mullahs by keeping the MEK in the bargaining hostage taking trade : the FTO list, and be serious in what it stand for : Freedom and benefits of its own people. If it really wishes to get rid of the source of Jihadists and terrorism, then its time it really takes a step and distances it self from "Cowardice" and steps into the realm of reality and takes sides. One cannot be a child and still boast to be the President of the US. being a child means that you want the doll and still don't want to be told off for taking a risk. The risk they have to take is to step over to the people's side like all those "good" have done in history.. YOU cannot side with RIBINHOOD and the Sheriff at the same time.. !! Then I would say yes... because the MEk is the only organised movement that has come around in the past 100 years of a resistance history in Iran and the middle east that as stood the worst evil elements such as Khomeini and have grown to be wise , independent and modern pluralists who do not insist and rely on a "jihad" to conquer the world for a medieval Islam that breeds Khomeinism. But instead believe in equality, brotherhood, peace and pluralism and secularism and unlike what the regime has dictated for the past 30 years do not wish power at all for themselves. The are the "modern robinhoods" whether we want to believe it or not. I hope I have given u the answer. But this is not enough. if you know your hackers friends and those who wish to side tiwh the good, they should mobilise and help the MEk where ever they are. They should join the good rather than target unknown enemy that lies only in the Internet. What should be done is to release the MEK from the chains of FTO so that they could really start their energies to release Iran and the are from this medieval fundamentalist cleric regime that is hated but feared bu 70 million people in Iran. then you will see wonders!